Once described by Robert Menzies as "the boy delinquent from Queensland", Bill Hayden is widely considered today to be the best man never to have become prime minister of Australia. (from Wikipedia) William George Hayden AC (born 23 January 1933), Australian politician and 21st Governor-General of Australia, was born in Brisbane, Queensland, the son of an American-born sailor of Irish descent. Bill Hayden was educated at Catholic schools and served in the Queensland Police Force from 1953 to 1961. He furthered his education through private study, completing an economics degree at the University of Queensland. Prior to the 1970s he was a self-described democratic socialist. He became active in the Labor Party, and in the 1961 federal election he surprised everyone, including himself, by winning the House of Representatives seat of Oxley, defeating Don Cameron, the Minister for Health in the Menzies Liberal government. Hayden was a diligent member of parliament and in 1969 he joined the Opposition front bench. When Labor under Gough Whitlam won the 1972 election, Hayden became Minister for Social Security, and in that capacity introduced Medibank, Australia's first system of universal health insurance. In June 1975 he was appointed Treasurer (finance minister), a position he held until the Whitlam Government was dismissed by the Governor-General, Sir John Kerr, on 11 November 1975. When Labor lost the 1977 election, Whitlam retired as leader and Hayden was elected to succeed him. His political views had shifted to the centre and he advocated economic policies which favoured the private sector and supported the American alliance. At the 1980 elections he improved Labor's position but failed to defeat Malcolm Fraser's Liberal government. At this election the popular union leader Bob Hawke, known to harbour leadership ambitions, was elected to Parliament. By 1982 it was clear that Fraser was manoeuvring to call an early election, and Hawke began mobilising his supporters to challenge Hayden's leadership. On 16 July Hayden narrowly defeated Hawke's challenge in a party ballot, but Hawke continued to plot against Hayden. In December Labor failed to win the vital Flinders by-election, reinforcing doubts about Hayden's ability to win an election. On 3 February 1983, in a meeting in Brisbane, Hayden's closest supporters told him that he must resign, which he did. Hawke was then elected leader unopposed. Later that morning, unaware of the events in Brisbane, Fraser in Canberra called a snap election for 5 March. At a press conference that afternoon Hayden, still emotional, said that "a drover's dog could lead the Labor Party to victory at the present time". Labor under Hawke won the 1983 election, and Hayden became Minister for Foreign Affairs, a position he held until 1988, performing competently but without evident enthusiasm. As Foreign Minister, Hayden advocated closer integration between Australia and its Asian neighbours. In a remarkable 1983 speech, he stated: "Australia is changing. We're an anomaly as a European country in this part of the world. There's already a large and growing Asian population in Australia and it is inevitable in my view that Australia will become a Eurasian country... I happen to think that's desirable." After the 1987 federal election Hawke offered Hayden the post of Governor-General to give him a dignified exit from politics and some consolation for having robbed him of the chance to become Prime Minister. Hayden's appointment as the next Governor-General to succeed Sir Ninian Stephen was publicly announced in mid-1988, and he immediately left parliament and severed all connections with the Labor Party. He assumed the post in early 1989, and served with discretion during the transition from the Hawke government to the Keating government in December 1991. Early in his term, he accepted a Companionship of the Order of Australia to fulfil the Governor-General's role as Chancellor of the Order, despite having previously said he would never accept any honours. 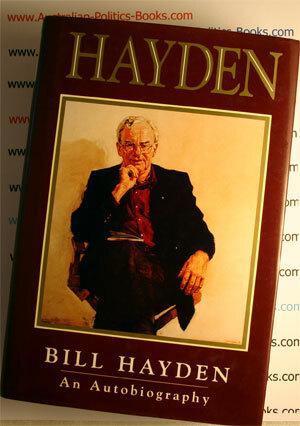 In 1996 Hayden was recognised as the Australian Humanist of the Year by the Council of Australian Humanist Societies. After Hayden left office in 1996, however, it became apparent that he still resented how he had been treated by the Labor Party. He had a particular animus against Paul Keating, who, he believed, had engineered the 1983 leadership change. In 1998 he used the occasion of a defamation case involving Bob Ellis and two Liberal cabinet ministers, Tony Abbott and Peter Costello, and their wives, to deliberately publicise rumours about Keating's personal life. By the late 1990s Hayden had become a conservative, joining the board of the conservative magazine Quadrant. During the 1999 debate on an Australian republic, Hayden adopted a monarchist position, completing his alienation from his former party and the left generally.